I've never been one for buying consoles painted with a single game, but this year's Call of Duty Xbox is relatively understated. Pardon the copy-and-paste press release, but really, what else is there to say? UAVs don't scare you. You laugh in the face of helicopter strikes. You think proximity mines are for rookies. And Prestige? Please, old news. 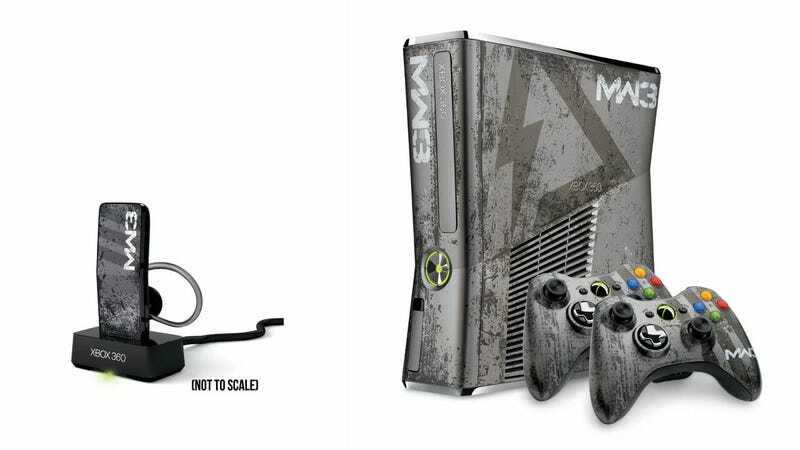 Prepare for the launch of the Xbox 360® Limited Edition Call of Duty: Modern Warfare 3 Console. Xbox, Infinity Ward and Sledgehammer Games teamed up to create a "Call of Duty" collectible, just in time for the most epic "Call of Duty" experience yet. Aside from its (air)striking good looks, the console will play unmistakable "Call of Duty" sounds when powering up and when the tray is opened. This must-have for "Call of Duty" fans worldwide includes a customized console with graphics from the game, along with two custom wireless controllers, a 320GB hard drive, a copy of "Call of Duty: Modern Warfare 3," as well as custom sounds when the console is turned on. A one month Xbox LIVE Gold subscription to Xbox LIVE is included so you can play to your heart's content, as well as exclusive avatar items that show your Xbox LIVE friends you're one of the lucky ones to own this coveted console. The console will launch on November 8, 2011 in the U.S., Canada, Mexico, Australia, New Zealand, and EMEA for $399 (U.S. ERP), and you can pre-order today at participating retailers. At 320GB, the console has the largest hard drive ever available for Xbox 360, with more than enough space to download and save game add-ons, downloadable content, games, music, photos, videos and movies. While "Call of Duty: Modern Warfare 3" does not support Kinect functionality, all Xbox 360 consoles are Kinect-ready for when you're ready to take a break from the battlefield. · The Xbox 360® Call of Duty: Modern Warfare 3 Wireless Headset with Bluetooth provides the ability to chat with friends during multi-player game play or with Bluetooth®-enabled mobile phones, PCs and other devices. Its artwork matches the custom console and includes a charging cradle, ear loop, ear gels, and an Xbox LIVE token for an exclusive download for $69.99 (U.S. ERP). o Users can chat without wires on Xbox LIVE and easily switch between Xbox 360 mode and Bluetooth mode. Use the headset with Bluetooth®-enabled mobile phones, PCs and other devices. The Xbox 360® Call of Duty: Modern Warfare 3 Wireless Headset with Bluetooth is the comfortable, hands-free way to keep the conversations going. · The Xbox 360® Call of Duty: Modern Warfare 3 Wireless Controller allows you to show all your friends your passion for the franchise. The controller includes exclusive artwork and a transforming D-pad that can be rotated to adapt to the user's game play, as well as an Xbox LIVE token for an exclusive download, all for $59.99 (U.S. ERP). For more information on the Xbox 360® Limited Edition Call of Duty: Modern Warfare 3 Console and accessories, visit www.xbox.com and visit MajorNelson.com for a video.